It’s not just the trains that are decrepit in the New York City subway system, it’s the stations as well. But everything is surely fixable, right? Well, a new report from the Citizens Budget Commission, a non-partisan non-profit, says that really, it is totally fixable. Though at current repair rates, it will take 52 years. That means all 468 stations will be considered to be in good repair in 2067. Which, in turn, means current New York City mayor Bill de Blasio will be a sprightly 106 years old by the time everything’s well and truly good to go. It’s not that no stations are getting repaired, they are. It’s just that things are breaking faster than the city can fix them. 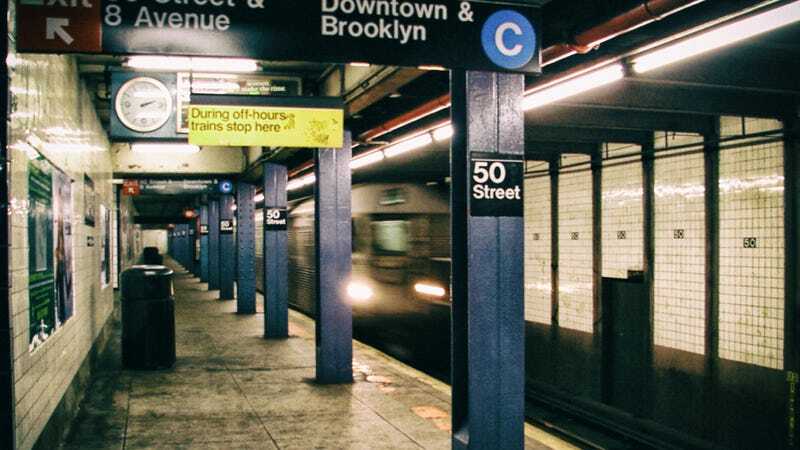 As the commission report lines out, the original plan of New York’s Metropolitan Transportation Authority was to assume every station had a useful life of 35 years before it needed a complete rehabilitation. The MTA was failing at rehabilitating whole stations, thanks to mismanagement and budget cuts. Keeping the system all looking tidy and safe would require 13 stations repaired per year, rather than the MTA’s ten. Things were actually getting worse before there was any mathematical possibility of getting better. More troubling is the prospect that the component strategy will still never be able to bring all stations to a SGR [State of Good Repair]. The practical useful life of a component varies based on use and environment of a station; however, even if components average useful life were 70 years—that is, twice as long as the MTA currently assumes—an average of 218 structural components, or 1.4 percent of the total, would reach the end of their useful lives and no longer be in SGR each year. The current pace of work under the 2010-14 plan is mitigating an average of 280 components per year. At this pace of progress SGR for all station components would not be achieved until 2067. The commission recommends prioritizing station repair, and injecting vast amounts of money for the project. Which is probably going to be difficult to do, considering all the trains, rails, and signals that still need to be replaced, all the hot garbage piling up in stations, and all the money that keeps getting diverted out of the city and into state coffers. Move to Vermont, is what I’m saying.